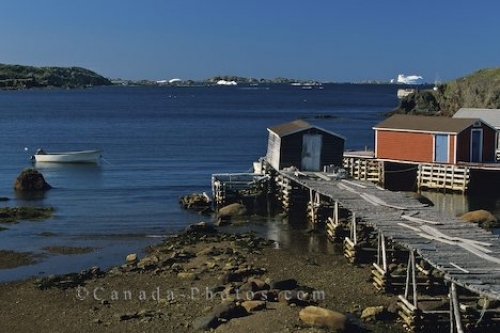 Along the shore in Twillingate, Newfoundland stands an old dock and a couple of updated boathouses. At low tide along the shore in Twillingate, Newfoundland stands an old shabby dock and a small motor boat anchored in the harbour. Twillingate is known as the Iceberg Capital of the World as you can see by the massive ones that float by in the backdrop. An old dock in Twillingate, Newfoundland, Canada, North America. Picture of an old dock in Twillingate, Newfoundland in Canada.